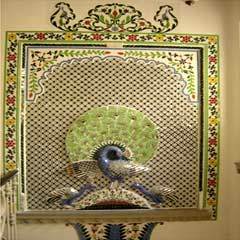 We offer an alluring collection of stained glass peacock which find application as decorative items in various sectors to showcase elegance and style. These stained glass peacock have various floral and geometrical patterns in a wide range of color and texture. The colors of these stained glass peacock cane be customized as per the client specifications. ACCESSORIES : 5 Play Carton Boxes with all weather proof packaging. If heavy boxes will be strapped. A creative collection to satiate your imaginative appetite and collectibles that you always yearned for are right here. Time to grab those eyeballs with this uber cool accessory from Poppuri. The range endows you with exquisite items and emphasizes on superior quality and unique designs. We are engaged in offering good quality Artistic Glass to our customer. We are a leading trader wide range of artistic glass. Artistic glass, building/decorating glass, industrial glass, glass machinery, etc.